This website is designed, developed and maintained by M/s Ventures Advertising Pvt. Ltd. for the Chennai Smart City Limited. These terms and conditions shall be governed by and construed in accordance with the Indian Laws. Any dispute arising under these terms and conditions shall be subject to the jurisdiction of the courts of India. The Information posted on this website could include hypertext links to external websites. 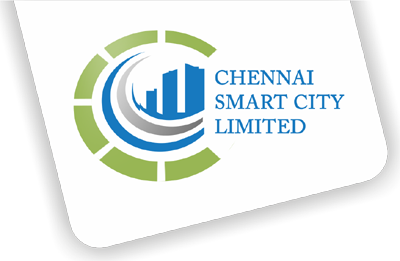 The Chennai Smart City Limited is providing these links and pointers solely for your information and convenience. When you select a link to an outside website, you are leaving "The Chennai Smart City Limited" site and are subject to the privacy and security policies of the owners / sponsors of the outside website. We do not object to you linking directly to the information that is hosted on our site and no prior permission is required for the same. However, we would like you to inform us about any links provided to our site so that you can be informed of any changes or updations therein. Also, we do not permit our pages to be loaded into frames on your site. Our website’s pages must load into a newly opened browser window of the user. At many places in this website, you shall find links to other websites. The links have been placed for your convenience. CSCL is not responsible for the contents and reliability of the linked websites and does not necessarily endorse the views expressed in them. Mere presence of the link or its listing on this website should not be assumed as endorsement of any kind. We cannot guarantee that these links will work all the time and we have no control over availability of linked pages. Contents of this website may not be reproduced partially or fully, without due permission from the Chennai Smart City Limited. If referred to as a part of another website, the source must be appropriately acknowledged. The contents of this website cannot be used in any misleading or objectionable context. Every piece of content appearing on CSCL website is reviewed for its accuracy in timely manner. Some of the short-lived content components like tenders, recruitment, upcoming trainings etc. does not hold any relevance on the website after the event or intended purpose. We do not collect personal information for any purpose other than to respond to you (for example, to respond to your queries). If you choose to provide us with personal information like filling out a Feedback form with an e-mail address or postal address, and submitting it to us through the website, we use that information to respond to your message , and to help you get the information you have requested. Chennai Smart City Limited has a Website Monitoring Policy in place and the website is monitored periodically to address and fix the quality and compatibility issues around the following parameters: Performance: Site download time is optimized for a variety of network connections as well as devices. All important pages of the website are tested for this. Functionality: All modules of the website are tested for their functionality. The interactive components of the site such as, feedback forms are working smoothly. Broken Links: The website is thoroughly reviewed to rule out the presence of any broken links or errors. Traffic Analysis: The site traffic is regularly monitored to analyse the usage patterns as well as visitors’ profile and preferences. Feedback: Feedback from the visitors is the best way to judge a website's performance and make necessary improvements. A proper mechanism for feedback is in place to carry out the changes and enhancements as suggested by the visitors.